In medium bowl, combine gelatin and boiling water, stir until gelatin is dissolved. With wire whisk, beat in yogurt until mixture is smooth. Refrigerate 1 1/4 to 1 1/2 hours or just until slightly thickened. Stir in orange segments and pineapple. Spoon and spread mixture into ungreased 9 1/2 or 10-inch deep-dish glass pie pan. Refrigerate 30 minutes or until set. 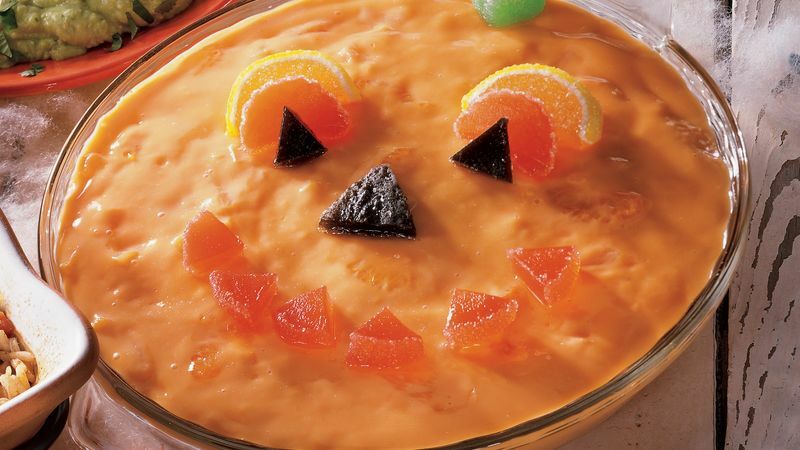 Just before serving, arrange candies on gelatin to resemble jack-o'-lantern. Do not use fresh or frozen pineapple in gelatin; the gelatin will not set. Sugar-free gelatin can be used in place of the sugar-sweetened gelatin. For individual pumpkins, pour the gelatin mixture into eight small round bowls.